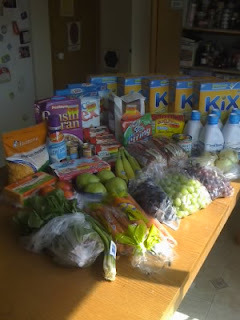 A Resourceful Home .com: Saturday Shopping - $54.67! I shopped way more than I intended do. Darn! Now we just won't have gas money - gah! I'm having a heck of a time sticking to $100 a week for my allowance. 5 boxes Kix - $1.99 each with store coupon($1/2 and $1.50/3 MC) = $1.49 ea. At this point I should have just been done shopping, but I really wanted to get grapes and pears at Fred Meyer. That would have probably been OK, but then I had to just check out the clearance bins . . . Finally I bought 5 bottles of formula for $.59 each after $5 coupons from a friend.